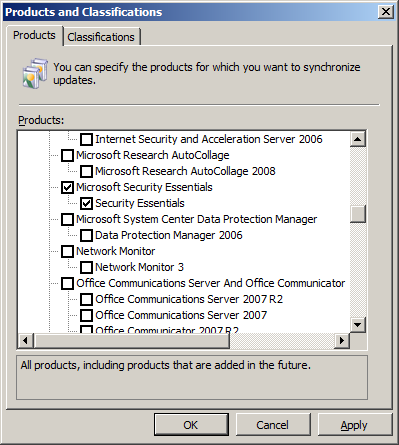 Microsoft have now started to release definition updates to Microsoft Security Essentials (MSE) via WSUS. This now allows any corporate that is running WSUS to centrally deploy pattern updated from a single server. While most corporation probably will not have MSE deployed in their environment it might still be worth while to enable to ensure any fringe cases of computers on the domain are still being secured. This Microsoft blog specifically calls this being done for educational institutes that have low cost PC’s connected to their network. I know this is not strictly a Group Policy, but WSUS does rely upon Group Policy heavily and therefore I find many Group Policy admin’s are also the WSUS admin’s for their organisations. 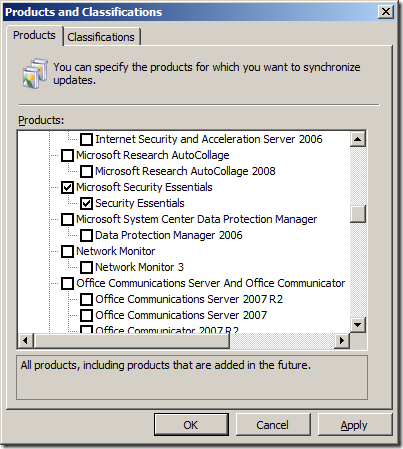 Heads up… I also hope to do a details blog about how to use Group Policy to configured WSUS in the future.